With all the photos of cute classrooms making the rounds on Pinterest, I’ve given some thought to what my classroom looks like. It isn’t cute and I’m OK with that. It’s organized, most of the bins match (because I only buy the same semi-indestructible ones), and my students and I can find what we need quickly. But it isn’t decorated. I don’t really have a theme. And I don’t think cute is an adjective anyone would use to describe it. I guess the reason I’m writing this post is two-fold. First, for those teachers out there that don’t have cute classrooms, I want you to know that it is OK. You’re in good company. There are plenty of us in the teaching world—even in elementary–with functional, student friendly rooms that don’t look like they came out of a teacher’s version of “Better Homes and Gardens.” The second reason for writing this post is a little more controversial. As professionals, how we spend our time and money setting up the classroom matters. 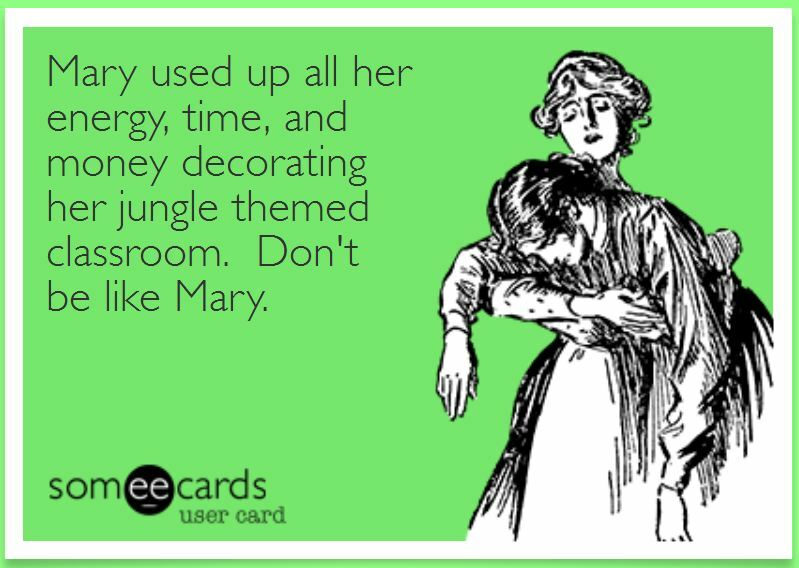 It speaks volumes about what we hold important, and frankly it worries me when I see classrooms where more energy was placed into pulling off a jungle theme than building a classroom library. BOOKS—If I have spare money, I use it buy books rather than decorations. In my classroom we call it “Book Christmas” when the Scholastic box arrives, and it’s a pretty big deal. Last semester I spent a small fortune building a cryptozoology section in the classroom library because my kids were crazy about bigfoot, aliens, vampires, ghosts, and monsters that year. I went to every Half Price Books within 60 miles of my house and wiped out their crypto collections. Right now I’m working to beef up my graphic novels tub, but that’s another post! Personally, I’d rather spend money to build readers than buy labels, borders, and notepads that match. FUNCTIONALITY—Everything in my classroom serves a purpose. Supply tubs have everything students need so we don’t lose instruction time during activities. The posters and anchor charts that line the room are relevant to what students are learning. Our classroom shelves hold tons of books, reference materials, and science supplies. There isn’t space for anything else. WE DECORATE TOGETHER–In fact, the walls are pretty bare when the students come in. I have a cursive alphabet chart up, but that’s about it. It’s our job as a class to fill that space with our learning. If you come back about 3 weeks later, it’s not bare anymore and students have ownership of what’s covering the walls. TIME—They say that we make time for what is important to us in life, and decorating is not at the top of my list. When it’s time to head back to school and set up the room, I revise systems so that my classroom will run more smoothly this year, or I plan and prep for lessons. In my mind, there’s more important things to do than put up colorful borders or paint all my tubs the same color. DISTRACTED STUDENTS—There are plenty of articles out there about how too much color and bling can take the focus away from learning for students who already struggle to pay attention. Check out this one from Scientific American. Food for thought! The article talks about kindergarteners. I teach upper elementary, but trust me, they get distracted too! Now, if decorating is your thing and it makes you truly, deeply happy, then go for it. Just please don’t give the side eye to those of us who do things differently. We have our reasons. And for you brand new teachers stepping into your very own classrooms for the first time, seeing blank walls and empty shelves, I offer this advice… Focus on the shelves first. If you’re lucky enough to have a little cash, buy a few books. Resist the urge to spend your hard earned money on jungle-themed décor. Purchase the essentials, a few tubs, some desk supplies, anchor chart paper and markers. Make peace with your bare walls and know that they won’t be bare for long. Well, I like things to have a theme, but I completely agree with you. I don’t buy things just because they are pretty – I buy them because I have a need for them. I try to match because of the attention issues you describe. However, my concept of matching is that I don’t look like the Lowes truck had an accident in my room! I have begun using black as my bulletin board background. and then just adding 2-3 other colors (when possible). As long as colors coordinate things look fine. I also have a million books, and new teachers should definitely start there. I am reading the CAFE book, and in it they say that kids don’t even look at teacher-made posters, etc – let the kids do it! Regarding the “cute” classroom ~ I have always decorated with borders and a couple of key philosophical statements like “Responsibility and Results, NOT Excuses” or something along that vein. I do this more for myself then my students … It is because I spend most of my waking hours in the room Monday through Friday (or Sun – Thu when I worked in Egypt). I need my room to be welcoming, orderly and decorated to make me feel good so I do it! I appreciate that it is a matter of style however I have heard kids say that the undecorated rooms of some teachers (I teach secondary) makes the kids feel like the teacher does not care. It may not be true but I am just saying what the kids say within my ear shot.